Juniors - Big League 43 ft.
Juniors thru Big League 60 ft.
Delivering a single pitch constitutes having pitched an inning. Majors & Up: Not more than 5 pitchers per team can pitch in a game unless illness or injury to 5th pitcher. Coaches, please use the pitcher eligibility forms included in the coaching binder to track pitchers and present this to the opposing coach prior to each game to show any pitchers that can't pitch. Please see LL official rules for additional details. The primary goals of Softball T-Ball are to have fun, to instruct children in the fundamentals of softball, and to allow them to experience the value of teamwork. Fundamentals to be emphasized are hitting, base running, fielding, throwing and good sportsmanship. Each Team Bats through the line-up once per inning. Example: If there are 12 players on the bench, 12 players will bat per inning (regardless of the number of outs made per inning). All players are eligible to play in the field. “Extra players” will be placed in the outfield. (i.e. – there may be a pitcher, catcher, 1st, 2nd and 3rd basemen and a shortstop. There can be an UNLIMITED number of outfielders.) The only exception is that an outfielder MUST be positioned in the outfield grass and MUST THROW the ball to an infielder to get an out. Example: With a runner on first, the batter hits a ground ball to the centerfielder. The centerfielder receives the ground ball directly behind second base, and steps on second to force out the runner. In this case, the force out will be disallowed and the runner will be called SAFE, as the outfielder did not “throw the ball in” to an infielder to obtain the force-out. Coaches, be prepared with your batting and fielding line-up. Attention spans are short at this age group and your ability to keep things moving for one hour will be appreciated by all. It will also allow the girls to have a positive experience and bring them back next season. The primary goals of Softball Junior Minors are to have fun, to instruct children in the fundamentals of softball, and to allow them to experience the value of teamwork. Fundamentals to be emphasized are hitting, base running, fielding, throwing and good sportsmanship in preparation for eventual placement on a Minors Division team. Game time limit is 1 hour and 30 minutes. A new inning will not be started after 1 hour and 15 minutes. Example: If a game begins at 6:00 p.m., a new inning may not begin after 7:15 p.m.
Roster batting or Rocket Rule will apply. If either team bats through the order, the inning will be considered over. If one team has fewer players, they shall be able to bat an equal number of players per inning. The coach (or assistant) will pitch to his/her own team. Coaches MUST pitch the ball underhand, and stand approximately 5 feet in front of the pitching rubber. Coaches may not field the ball. A batter CAN STRIKE OUT. Five strikes per batter. Example: If a girl swings and misses a FIFTH time, she is out. Nine players in the field. 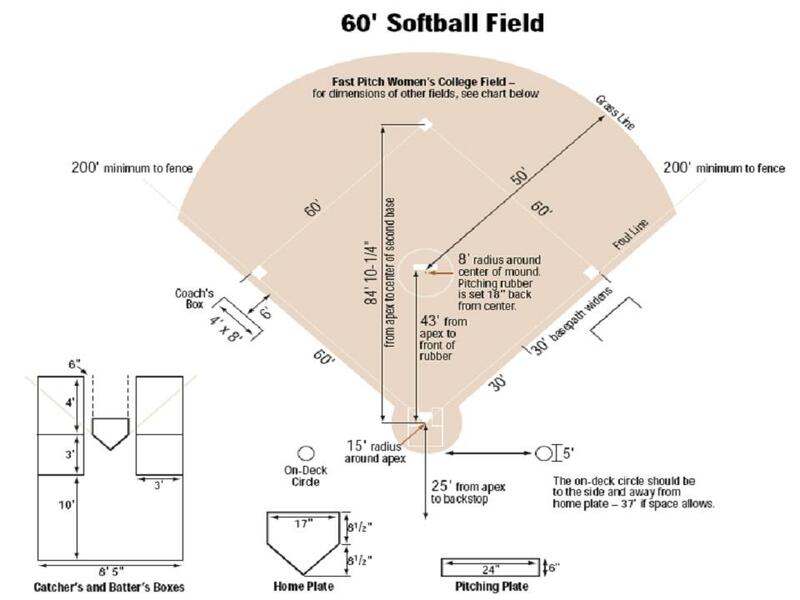 The player positioned at the pitchers mound must be within 5 feet of the mound prior to a pitch (it is the responsibility of the coach who is pitching to make sure she is in the proper position for a right handed or left handed hitter). An outfielder MUST be positioned in the outfield grass and MUST THROW the ball to an infielder to get an out. The primary goals of Minors are to have fun, to instruct the children in the fundamentals of softball, and to allow them to experience the value of teamwork. Fundamentals to be emphasized are hitting, base running, fielding of grounders & fly balls, throwing & pitching, and good sportsmanship in preparation for eventual selection to a Majors Division team. Game score will be kept. Results will be provided to the division coordinator by phone or e-mail weekly (these will determine seeding for the playoffs). Three strikes is an out. Four balls is a walk. Pitchers will stand 5 feet in front of the regular pitching rubber (if there is not a temporary pitching rubber available). Each half inning (or as needed), the coaches will re-draw a pitching line for the pitcher (or re-secure the temporary mound). A pitcher may not pitch more than 2 innings per game unless we go into 5th inning the 1st can go back in. After 4 total walks in an inning (walks do not need be consecutive), a coach of the team at bat will enter the game as pitcher and pitch to his/her own team from the pitching rubber. The batter can not draw a walk, but can strike out swinging or looking (the umpire will continue to call strikes, but not balls). At this point, all stealing is prohibited and runners may not advance home on a passed ball. The coach will also position the displaced pitcher behind him on one side or the other (based on a right handed or left handed batter). The coach MAY NOT field and MAY NOT provide instruction to his/her runners on base at any time. Infield Fly Rule will NOT apply. Nine players in the field. A player may NOT sit out more than 2 consecutive innings (unless injured). An outfielder MUST be positioned in the outfield grass at the start of each pitch. An outfielder DOES NOT need to throw the ball into the infield to obtain an out. The primary goals of Majors are to have fun, to instruct the children in the fundamentals of softball, and to allow them to experience the value of teamwork. Fundamentals to be emphasized are hitting, base running, fielding of grounders & fly balls, throwing & pitching, and good sportsmanship in preparation for eventual selection to a Juniors Division team. A regulation game is 6 innings or 2 hours. A new inning will not be started after 1 hour and 45 minutes. Example: If a game begins at 6:00 p.m., a new inning may not begin after 7:45pm. Example: If a game begins at 6:00 p.m., a new inning may not begin after 7:45 p.m.
Roster batting or Rocket Rule is allowed for inter-league play (not in District 9 team tournament play). STEALING IS ALLOWED TO ANY BASE. The runner can leave the base when the pitcher releases the ball. A runner MUST slide when there is a play being made on the runner. Failure to slide may result in the runner being declared OUT for creating an "Unsafe" situation. (Coaches, teach this simple rule: "When in doubt, SLIDE"). Batter may run to 1st on 3rd strike dropped ball, defender must tag runner or touch 1st base with ball in hand. Game scores are to be provided to the division coordinator by phone or e-mail weekly. An inning will be considered over after 3 outs or if the team batting scores 5 runs (5 run maximum per inning). This rule applies to all innings in a game. A pitcher may not pitch more than 3 innings per game. Infield Fly Rule may apply as determined by the umpire. THE PITCHING CIRCLE: When the pitcher is in possession of the ball within the circle, and not attempting to make a play on a runner (i.e. "the pitcher is at rest") the runner(s) MUST IMMEDIATELY decide to advance or return to their intended base, or they may/will be DECLARED OUT (no warnings) by the umpire. If the pitcher is within the circle and attempting to make a play on the runner (i.e. "faking throws") the runner(s) need not return or advance to any base. Refer to the latest revision of the LL rule book.